Shanonpatr Wiratchai (aka. Shannon “OneShin” Wiratchai) started learning martial arts at the age of 8, when he was exposed to Chinese martial arts and Judo. Shannon has extensive competition experience in Judo and wrestling. He became a professional MMA competitor in 2011, has competed in DARE MMA Championship and is currently signed to ONE Fighting Championship (OneFC), the largest MMA league in Asia. His current professional record is 8-2-0. He can be seen regularly on the popular Thai reality TV program “Martial Warrior”. Kru Thep is an active competitor still fighting in Muay Thai and also recently Western boxing. He has 272 Muay Thai fights under his belt with 200 wins, 70 losses and 2 draws. He started training at age 9 in the Eastern province of Ubon Ratchathani. He is the Max Muay Thai reigning champion at 55kg (121lbs) and also the WPMF (World Professional Muay Thai Federation) current champion. In boxing he has recently had title fights for the WBA, WBC and IBF. He trains hard and has a very classic style of fighting. 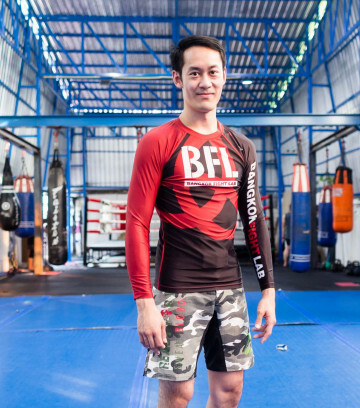 We are proud to have him represent Bangkok Fight Lab in his continuing combat sporting career. 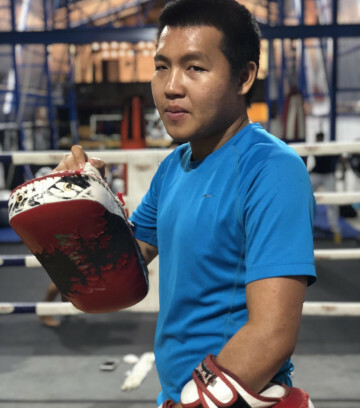 39 year old Kru Nam, full name Pornpirum Nimma, Muay Thai name Bitpom Lougchowpawpaklong, started Muay Thai at age 15. He has fought 60 times, with 42 wins and 18 losses. A humble, happy coach who has a great understanding of the different needs of his students. He teaches classic Muay Thai techniques and training methods but makes every class fun, perhaps putting a little less pressure on his students than our other trainers. 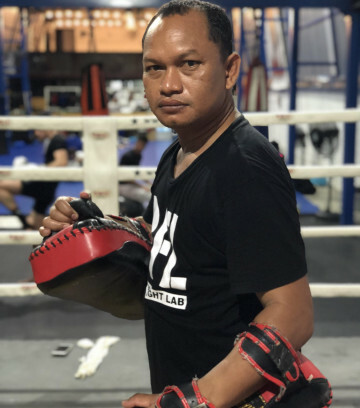 Kru Songkram is our oldest and most experienced trainer at 52, fighting since the age of 12 he has 24 years of Muay Thai and boxing fight experience in both Thailand and China, and has been coaching for over 18 years. He is from the Northern province of Phetchabun but has lived in Bangkok for the last 38 years. His fight record stands at 183 fights, 150 wins, 30 losses and 3 draws. 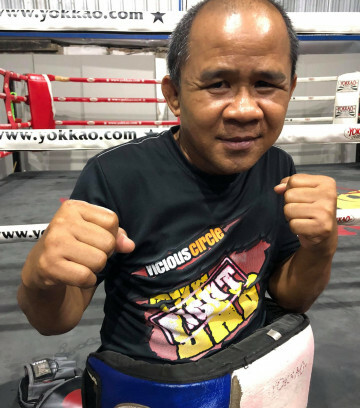 He won Muay Thai Northern Part championship titles twice at 95lb (43kg), and five times in Bangkok in Rajadamnern Stadium at 105lb (48kg), one of the two Muay Thai mecca stadiums in Thailand (the other is Lumpinee). After retiring from Muay Thai he competed in Western boxing and acheived two international championship titles (BABA and WBA) at 105lb. 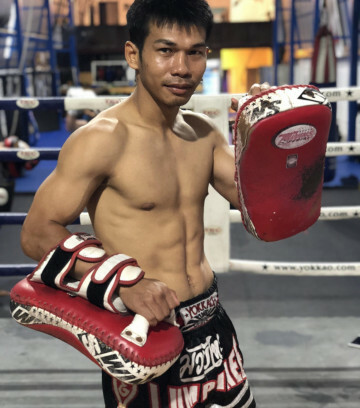 Kru Vit, born in 1988, real name Pravit Kakaew, Muay Thai name Witthyanoy Sitguanim, began training at 8yrs old in Samut Prakan, a Bangkok suburb. He has fought 170 times, with a record of 130 wins and 40 losses. He won two championships at Rajadamnern Stadium, fought in the UK, became K-1 of Busan champion, and had further title fights at the famed Rajadamnern Stadium. His brother Kru Wut is also a BFL Muay Thai trainer. 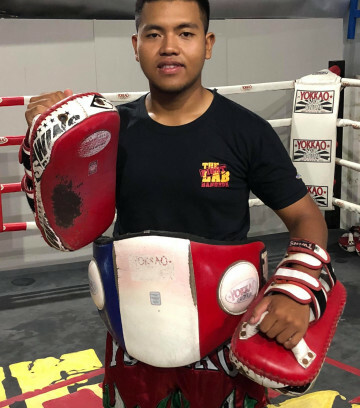 Kru Wut, real name Vorawut Kakaew, Muay Thai name Vorawut Luksamranchai Sitchaomaeguanyin, is 22yrs old and younger brother of our trainer Kru Vit. He started training at the age of 9 and has had 52 fights in his short fight career, with 35 wins and 15 losses. He gave up fighting so he could coach full time and he brings a friendly and easygoing style of coaching to the gym. Thien started training BJJ in the UK with the Gracie Barra team at The University of Nottingham and received his blue belt from Ben Poppleton. He also trained with Braulio Estima in Birmingham and after two years in Nottingham, he then had the chance to train with the London Shootfighters team, which helped him develop wrestling and No-Gi skills. He then joined Carlson Gracie London and was awarded his purple belt by Wilson Junior. In 2008, he returned to Bangkok and continued his study of BJJ receiving his brown belt from Lee Livingstone.